Northridge: Lord John Press, 1979. First Edition. One of 50 numbered copies in a deluxe binding signed by the author, Ross Macdonald, Very fine. Northridge: Lord John Press, 1979. First Edition. One of a very small number of presentation copies, so designated on the colophon page, signed by the author Ross Macdonald and bound in the deluxe issue binding. Very fine. Northridge: Lord John. Very Fine. 1979. First Edition.. Galley/Proof Unbound uncorrected flat-page proof with two pages to a sheet. Very fine. .
Northridge: Lord John Press, 1979. Large octavo. Cloth and marbled boards. First edition, deluxe issue. One of fifty numbered copies, specially bound, and signed by the author. Fine, without dust jacket, as issued. Northridge: Lord John Press,, 1979.. First edition, deluxe numbered & signed issue.. 67 pp. A few tiny spots to fore-edge, and shelf-wear to bottom edges of boards; in all near fine in marbled paper-covered boards with cloth spine. One of 50 numbered copies SIGNED by MacDonald. Edition: First edition, deluxe numbered & signed issue. Northridge, California, Lord John Press, 1979., 1979. 8vo. Original 1/2 gilt stamped light blue cloth over marbled boards. Fine. 67 pages. Issued without dust jacket. No other signatures or bookplates. Number 14 of 50 numbered copies, signed by MacDonald on limitation page; designed and printed by Grant Dahlstrom.. Signed by Author(s). Hardcover. Fine/No Jacket. Northridge: Lord John Press, 1979. First Edition. One of 300 numbered copies signed by the author, Ross Macdonald. Fine. 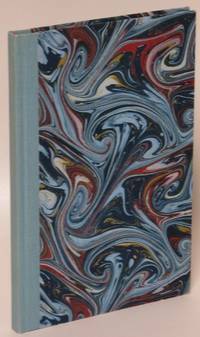 Lord John Press, 1979 This is one (number 16) of fifty deluxe signed copies, bound in blue marble paper over boards. Fine condition. There were 300 additional numbered and signed regular copies issued at the same time.. Signed by Author(s). Limited Edition. Hardcover. Fine/No Jacket. Northridge: Lord John Press, 1979. One Quarter red cloth over grey paper boards. Gilt titles to spine. Number 176 of 300 copies signed by the Author. Fine copy with just a touch of edgewear.. Signed By the Author. 1st. Cloth & Boards. Fine. Octavo. Lord John Press, 1979 One of 350 signed limited copies, this copy is fine in boards and signed by MacDonald on the limitation page. Also inscribed ("with regards and thanks for his interest in my work") by MacDonald to Brian Kirby, the renowned book scout for Serendipity Books.. Signed by Author(s). Limited Edition. Hardcover. Fine/No Jacket. Northridge, California, Lord John Press, 1979., 1979. 8vo. Original gilt stamped 1/2 red cloth over gray boards stamped in red. Fine. 67 pages. As issued without dust jacket. No other signatures or bookplates. Number 24 of 300 numbered copies, signed by MacDonald on limitation page; designed and printed by Grant Dahlstrom.. Hardcover. Fine/No Jacket. Northridge: Lord John Press, 1979. Limited First Edition. Octavo; VG/no-DJ; blue spine, gold text; boards have light bumping on the head and tail of spine, otherwise boards are strong and clean; textblock and interior pages clean; limited edition; signed; one of three hundred and fifty copies; signed and numbered on limitation page; pp 67. Full-priced Rockville. Northridge, CA: Lord John Press, 1979. Limited Edition. Number 4 of 300 numbered copies. SIGNED BY THE AUTHOR. Red cloth backed gray paper coverd boards. A bright and very fine copy, appears unread. . SIGNED. First Edition. Hard Cover. Fine/No jacket as issued..